There are many reasons for using gold. When put in correctly with a perfect fitting casting the end results can me amazing. Also with using gold the restoration can last a life time. 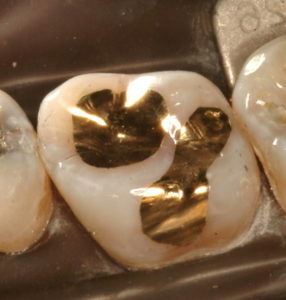 With Gold there are great marginal fits, not causing any trouble to the gingival tissue, and as you already know there is no allergic reaction. My gold work when finished, the casting and finishing are brought to such a great high shine and polish that they are even smoother that the some of existing teeth. I finish the gold the same as you would in the mouth so when you are at the completion smoothing the gold margins into the tooth, everything is just perfect giving the patient the very best of dentistry that you can possible give your patients.